Company Associates in the industrialized world for a training period of one to three weeks. working in plants of IUPAC Company Associates in industrialized countries. IUPAC, working with the United Nations Educational, Scientific, and Cultural Organization (UNESCO) and the United Nations International Development Organization (UNIDO), has established and maintained the Safety Training Program to promote interactions between developed countries and the developing world to disseminate state-of-the-art knowledge on safety and environmental protection in chemical production. Each scientist or engineer accepted into the Safety Training Program is assigned to an IUPAC Company Associate in an industrialized country. Accommodation, subsistence, and travel expenses are provided for all trainees. 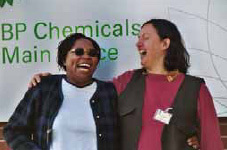 2003 fellows Jane B. Nyakang’o (UNIDO Kenya National Cleaner Production Centre) and Ana Luisa Arocena (CEMPRE Uruguay) seriously enjoying their visit of the BP Chemicals Technology Center in Naperville, Illinois, USA.